Back on the trail and glad of it… Just two days to finish the aqua blaze. it’s a lot harder than imagined. We were back on the trail before noon and as we hiked were told of trail magic at Blackburn center, Free dinner!!! So that became our goal… To Eat!!! We made it by 5pm and had a feast with about 15 others. Awesome. Today we passed the yellow 1000 mile pole and passed from VA to WV. Tomorrow we will make our way into Harpers Ferry with a short 12 mile hike and check in at the ATC conservancy for my official weigh in and photo. I have heard so far that 340 hikers have made it this far and received their check in numbers. Out of 2 to 3 thousand that started… I’m in good company. 16 Responses to 1000 Miles!!! Congrats on 1000 miles. You’re making it look easy brother! Press on! Congrats dude! I’m diggin the beard! Epic! You’re a hiking fiend! Congrats…. Magical Trails. Congrats Chris on reaching 1000 miles. Just a few more to go. Man, you must put in a few hundred steps a day to get this far. Jim Hart is jealous. WOO HOO!!! I’m proud of you Tank! 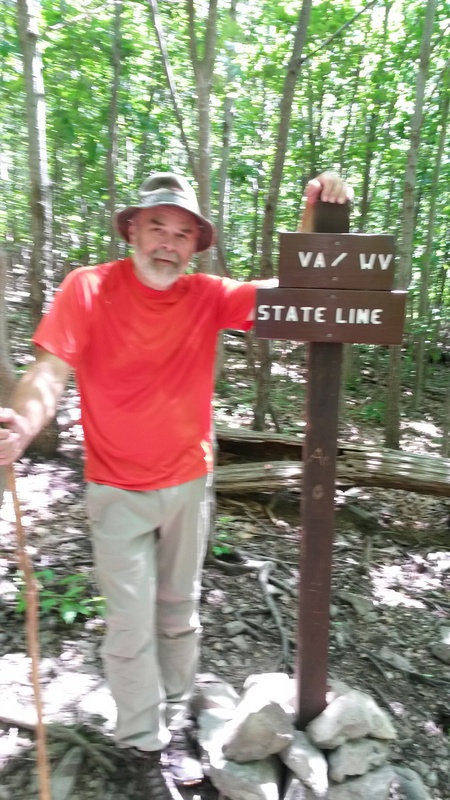 For the past three decades, long-distance hikers arriving at the midway point of the 2,180-mile Georgia-to-Maine footpath have made it a tradition to stop at Pine Grove Furnace State Park in south-central Pennsylvania and eat an entire brick of ice cream. The reward: bragging rights, a small commemorative wooden spoon stamped in red letters with “Member of Half Gal. Club,” and quite likely an upset stomach or a nasty case of brain freeze. DON’T DO IT CHRIS!!! I read the guy’s blog, he couldn’t hike the rest of the day, or eat that flavor ice cream the rest of his life! wow! 1000 miles. You are making great progress. I agree with Sarah on the ice cream… don’t do it! You look like Sean Connery when he played Indiana Jones father in one of those movies. Thats supposed to be a compliment. AHHH. The halfway point is sooo close. Great hiking Tank! It will be all downhill from there with no rocks…NOT. Tank you took out the big one when you stepped into West Virginia! Congratulations! Your making it look easy but I know you have had your trials! Keep going and have a bowl or brick of ice cream when the time comes! You have earned the right to eat what you want! Praying for your continued success! PEACE! That’s an amazing accomplishment Chris! Wow! A 1000 miles! Now thats impressive!